I have already commented about the wonderful lady that was Rear Admiral Grace Hopper and her contribution to the world of computing. From her time working during the Second World War on the Manhattan Project to finding the “first computer bug”. 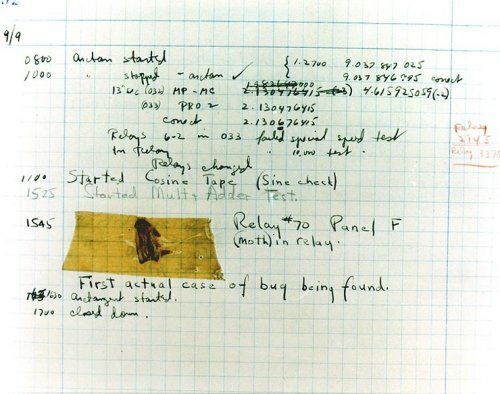 This bug still exists and can be discovered at the Smithsonian Institution’s National Museum of American History. In the 50s she became one of the creators of COBOL. A language that is still, in part, used today. Getting your money out of an Cash Machine to completing your tax returns some of this process will go via here invention. She also appeared on Letterman just after she retired in 1986 talking about her “43 and a half” years of service and her other accomplishments. Still sharp, and funny, as ever. Born as Grace Brewster Murray in New York in 1906, she later studied at Vassar College and in 1934 became the first woman in Yale University’s 233-year history to graduate with a doctorate in maths. She married Vincent Foster Hopper, in 1930 and retained his surname after their divorce in 1945. Between her marriage and divorce she joined the Navy. During this time, and as war was going on, show worked on one of the first computers, the Harvard Mark I, helping compute firing tables for artillery. a lot has been said about her next career move, and the invention of the first compilers – like what I have mentioned above. You can read it all over at the biography.com. Her naval legacy is still going strong with the USS Hopper, a ship still on active service today.